The subject of this essay is the Labour Party of which Jeremy Corbyn is leader, and its implications for the left in Scotland. I'm impressed by Corbyn, despite his total failure to understand the situation in Scotland and his schoolboy errors - perhaps passed to him by someone else - about the SNP's alleged 'privatisations'. He is, I believe, genuinely a person of the left; genuinely a person of peace, of sharing, of consensus building, of honesty and of egalitarianism. I suspect that he would name Ghandi as one of his inspirations; I think that he would mean it. One can imagine him sitting perfectly happily at Harold Wilson's cabinet table, or Clement Atlee's before him. But one cannot imagine Jeremy Corbyn sitting happily at Jeremy Corbyn's shadow cabinet table, and therein lies the problem. Because - with the solitary exceptions of Diane Abbot and his Shadow Chancellor John McDonnell, all of his shadow cabinet would have been sitting not on Harold Wilson's front bench, but on Edward Heath's, opposite him. And this is the point. 'The Labour Party of which Jeremy Corbyn is leader' is not at all the same thing as 'The Labour Party led by Jeremy Corbyn'. Jeremy Corbyn was elected - overwhelmingly - by the members and supporters of the Labour Party. The footsoldiers who go out and campaign, who knock doors, who fill in canvass returns, who stuff leaflets through letterboxes. The footsoldiers who, as I reported a year ago, so notably didn't turn out in the independence campaign. Labour's problem is that it is two radically different parties. Corbyn's party is the footsoldiers' party; 'Old Labour', a party which someone my age has no difficulty in recognising as the linear descendants of Atlee's party. But Labour elected politicians are overwhelmingly 'New Labour', an Oxbridge educated metropolitan elite. That's come about because Labour had come to be a regular party of power; a party which aspiring carreerist power-seekers saw it as in their personal interests to join. And over at least the past forty years, bright, articulate, self-confident Oxbridge graduates have over-awed ordinary Labour members at candidate selection meetings, and have consequently colonised the Labour benches. And Corbyn's problem is that actually these elected politicians don't give a stuff about what the members and supporters think: they assume they can use their privileged access to the media to talk over the heads of the members and supporters to the electorate. It's common parlance within the Labour party to accuse the faction(s) you disagree with of being 'entryists'. Just now, the Blairites are accusing the 'Corbynistas' of being entryists. But as I've said, it's obvious that it's the Corbynistas who inherit their ideology from the Labour Party of Atlee and Bevan. They are the traditional Labour party: a broad church of unionised workers and leftist intelligentsia. The Blairites - in so far as they have any discernable ideology beyond 'power at any price' - are not. So, seriously, who are the entryists? The SNP, like Labour, is a broad church; Nicola Sturgeon, like Jeremy Corbyn, is substantially to the left of many members of her cabinet, and, like Corbyn, is, I believe, held back in consequence. But the SNP is bound together by a single overarching goal: the independence of Scotland. It also has the benefit that it is relatively new to being a 'natural party of government', and consequently doesn't yet have the cadre of power-hungry opportunists that Labour has attracted. Labour, by contrast, has nothing to bind it together and is, I suggest, now rapidly unravelling, across the rest of the UK as much as here in Scotland. There is no natural alliance between socialism, however loosely defined, and neoliberal capitalism. Nothing unites 'the common ownership of the means of ...exchange' with first the deregulation, and then the bailing out, of private sector financial institutions. No-one can find a compromise between securing for the workers the full fruits of their labour on the one hand, and rentiers getting filthy rich on the other. There is no common ground between meritocracy and inherited wealth. All this, I think, has lessons for the left of the independence movement. We have sought to be a broad, inclusive, unified movement; but currently the main political expression of that movement is the SNP, who talk the left wing talk but are much less good at walking the left wing walk, and who tend to the illiberal besides. We've seen the centralisation of the police; the council tax freeze which has robbed local authorities of discretionary spending power; and they're currently turning their coats over land reform, frightened of the - admittedly considerable - power of the landed interests. I grant the SNP government have been - surprisingly - competent; the present relatively minor scandals are virtually their first. But the SNP cannot be above criticism. They must be challenged from the left. They must be challenged on land reform and on land tax. They must be challenged on basic income. They must be challenged on public ownership and on workers' co-operatives. They must be challenged on planning and housing law. They cannot be challenged from the inside. The SNP leadership have stifled debate on the Monarchy and Nato. Tactically, they were probably right to do so; but Scotland needs to hold those debates. They've stifled debate on currency and I'm utterly convinced that was a grave tactical mistake. But again, Scotland desperately needs that debate. So as there is no place in Labour for both socialists and neoliberals, just as the internal contradiction between those positions is driving Labour to ruin, so it is impossible to reconcile in the independence movement those careful tacticians trying to build the broadest possible consensus, and those wild-eyed visionaries who are trying to create the blueprint of a better nation. The left, here in Scotland as in England, needs its own party, and in Scotland as in England that party cannot be the Labour Party the neo-liberals have such a firm hold of. We must have our own Scarlet Banner to raise high. 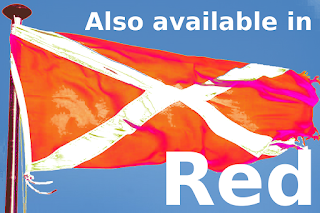 The saltire must also be available in red. Things fall apart; the centre cannot hold. But we shall rise, now, and be that nation again!